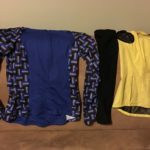 An article by Janine Copple Comments Off on Trail Ramblings: Riding In Northern Climes. Here in Nebraska many, if not most, people tend to think that riding a bicycle is a warm weather activity. 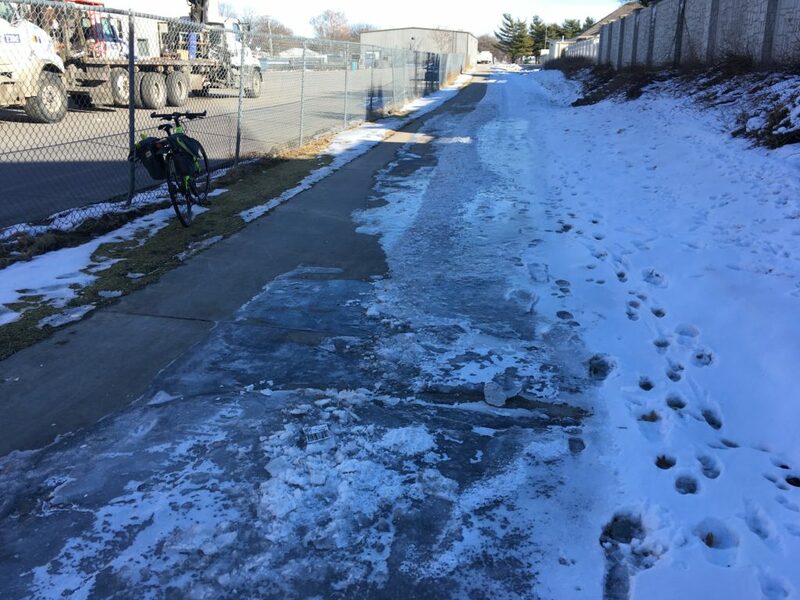 They may even question whether bike trails are used enough in the cold months for them to be “cost effective” or kept ice-free. Those of us who are aware of such things notice many winter riders in places like Colorado and Minnesota. But it’s not just Minneapolis that is a cold weather biking powerhouse. If we look to our northern neighbor, we see that Canadians are taking winter bicycle commuting seriously. (In 2014) “At the time, about 730 people cycled on the two streets combined each day, and there were questions (as there always are) about demand in a city where it’s cold much of the year. Could you really justify giving a whole lane to the use of those 730 cyclists? But as former Vancouver planner Brent Toderian is fond of saying, you cannot justify a bridge by counting the number of people who currently swim across the river. And so it seems to have been with these bike lanes, which attracted 10 times as many cyclists — 7,509 a day — in 2018.” To read the whole article go to The Edmonton Bicycle Society on Facebook, or https://www.thestar.com/opinion/star-columnists/2019/01/11/bike-lanes-prove-that-transportation-solutions-can-be-cheap-and-effective.html. 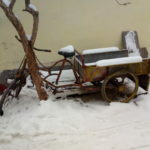 And they do ride all year around. The article goes on to quote a report that “On top of that, the roads were safer. Both motorists and cyclists reported in surveys that the roads felt more comfortable to travel on, and there were significant reductions in both motor vehicle collisions involving injury or death (down 18 per cent) and in all cyclist collisions (down 73 per cent)”. The streets in question were reduced from four lanes to three, like our own 13th street. 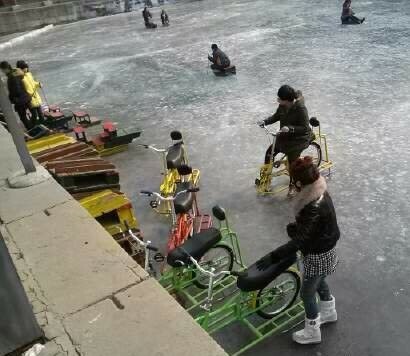 Wouldn’t it be fun to ride these ice bikes? Seen in Beijing. But what about ice and snow? It takes a pro-active approach, to be sure. I wonder if the trails get brined, or how they’re otherwise treated in these northern cycling success stories? It’s every winter cyclist’s worst fear to to slip, crash and get hurt. My niece cracked her upper humerus Friday trying to turn onto the N street cycle track after work. She hadn’t noticed that the freezing mist had made even walking dangerous by that time, and wasn’t running studded tires. Earlier in the day, while a crust of ice formed on my glasses and coat, the trails were not frozen, except for under overpasses, strangely. By mid afternoon however, it was all turning to ice. In these conditions take extra care turning and stopping and use your rear brake. I recommend slowing sooner and putting a foot down. Remember that curb cuts can be treacherous. Some bridges are still bad, N.14th crossing Salt Creek and Oak Creek on the new bike trail connector come to mind. Other usually bad places, like the hill on the South Pointe trail are unusually good, so kudos on that. 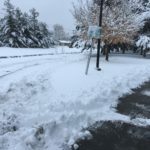 Much, but not all of the thin ice coating trails and streets has burned off, but the forecast is staying cold, so continue to take care and keep those hands, face and feet bundled. This newly paved section of the Murdock Trail near 56th is still having drainage issues, so watch out.